Oeko-Tex certification. The products is free from any harmful substances = Confidence in Textiles. Fairtrade certification guarantees the cotton farmer a minimum price for their cotton, which covers the cost of sustainable cotton production. Oeko-Tex Certification. A guarantee that the garment is consistent with REACH, an EU directive. Made of 43 pieces recovered PET bottles. Oeko-Tex certification. The product is free from any harmful substances = Confidence in Textiles. Eco-friendly jacket made of 100% recycled polyester. GOTS Certification. Ensures that human rights and ILO core conventions are followed and that the garment is made of organic cotton. How would your garments look like based on your requirements for function and durability? Are you satisfied with the delivery? Would you recommend TS to others? TS website is powered by 100% green electricity from our ISO 14001 environmentally certified server supplier, The Generation. TS Design & Production AB was founded in 1990 by a group of people including me, Anders Karlsson. We design, manufacture, store and distribute promotional wear. Everyone has the right to feel good. Human rights are a given for us, but not necessarily for the industry. Work closely with the supplier as well as the customer. If planet earth doesn’t feel good, we don’t feel good. Help the customer choose the best option. Never go in over your head. Limit your number of customers. Offer a carefully selected product range. Deliver the quality you agreed on, on time. Carefully choose the people you work with. Only work with those who share your values. Never have anything to hide. What drives us is the notion that everyone has the right to feel good. For this reason, we make clothes that are comfortable, stylish, and functional and can withstand hard use. Our clothing strengthens the experience of our clients’ brands. That ought to be obvious, but it’s not. We also want our products to contribute to a better working environment not only for our customers but also where they are manufactured. It ought to go without saying that clothing should be manufactured under decent working conditions, without undue impact on the environment and climate, but often it’s not. To ensure quality and durability, we only work with a handful of customers, a few suppliers and with a carefully selected range. We choose to cooperate with partners who share our most important value – that everyone has the right to feel good. In our declaration of responsibility you can read more about how we work to ensure that our customers and suppliers should feel good. We offer comfortable, stylish and functional promotional wear for restaurants, shops and other workplaces. Our customers have different needs and wants. We always ensure that they are satisfied. We manufacture the majority of our products ourselves, in the factories we work directly with, with no middlemen. The solutions we deliver are fully customised and based on the needs of our customers in terms of materials, fit, profiling and function. This way we also ensure quality and durability throughout the entire process. In addition to the clothes we produce ourselves, we also offer a range of clothing from a number of other selected brands. Our customers have the opportunity to buy clothes that are certified according to Fairtrade, GOTS, GRS and OCS. The fact that we can offer certified clothing means that we fulfill the financial and administrative commitments we have towards the respective certification bodies. We have also carried out a calculation of the climate impact in the supply chains where the majority of our garments are manufactured. The calculation includes all steps in the process, from cultivation to sale. Read more about this work here. Based on the calculation, we compensate for the garments through ZeroMission via a Fairtrade-certified project in southern India. Read more about the project here. Click here to find out more information about these different certifications. We are driven by a desire to ensure that our customers feel good. They have to be certain that we are going to deliver the right clothes, to the right place and at the right time. They shouldn’t have to worry about quality, storage or transportation. Everything should just work. Our logistics service allows the customer to focus on their core business. We provide storage, distribution and an online shop, all tailored to the needs of our customer. We provide storage for those of our customers who need it. We then send the clothes ordered straight from the warehouse to the customer or directly to the user. Orders from the warehouse can be carried out in different ways. One option is through our web shop solution. We can offer our customers access to a customised web shop. Thanks to the store being maintained in our own business system, everything can be done in real time, and we handle each order directly. We can also make customisations to facilitate order follow-up. In the web shop, the collection available to the end-user is on show. Multiple users or dealers can have access to the web shop, but it is the customer who determines the framework for how the collection should be used. Through our web shop solution, our customers get control over the use of clothing and the availability of real time follow-up of costs and usage. 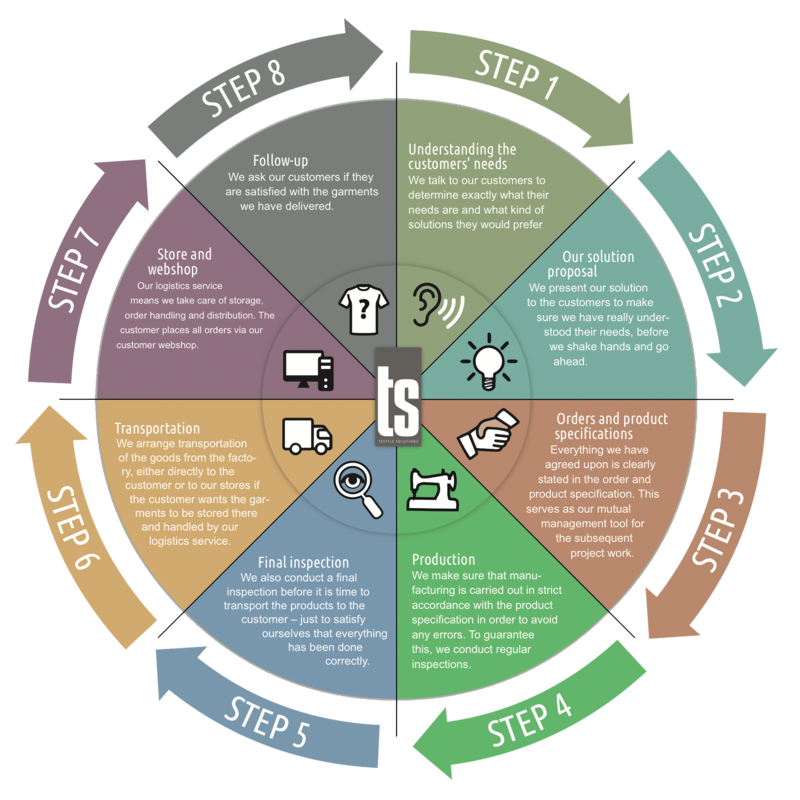 This makes it possible to plan and optimise their needs of promotional wear. Primarily, we work directly with the factories, without any intermediaries. Besides our personal visits to our factories, we are also subject to reviews by accredited auditors on the basis of the amfori BSCI Code of Conduct. Our customers are always welcome to review the reports from such audits. Clothes not manufactured in the factories we have direct contact with, we purchase from other brands. We have carefully checked them out so that we know that they maintain the same high standards as we do. Here, you will find a list of the questions we ask them. Our customers are always welcome to look at how these various brand names have responded to our questions. The brand names that we use can be found here. We offer our customers certified promotional wear. In this way we can ensure sustainability in elements of the supply chain that would otherwise be difficult for us as a small company to control, for example, production of raw materials. Certification also serves as a guarantee that we work in a sustainable way. Certification work is a component of our endeavours with quality and sustainability. We see this as a good addition to the responsibility that we otherwise take. You will find more information about our responsibility commitment here. We are since 2017 members in BCI – Better Cotton Initsiative and we are also active members of the BSCI – Business Social Compliance Initiative since 2009, and we climate compensation since 2013 for all our transportation operations by Zero Mission. Our membership of amfori BSCI gives us the means to follow and improve working conditions in manufacturing. The production of our own garments is always followed up in accordance with amfori BSCI regulations. TS has been a member of amfori BSCI since 2009. Since 2013 we have climate compensated for all of our transportation operations through our participation in charcoal stove projects in China. We do this through ZeroMission which is U&W’s climate service. As the first in the industry, we have carried out a calculation of the climate impact in the supply chains where the majority of our garments are manufactured. The calculation includes all steps in the process, from cultivation to sale. Based on the calculation, we compensate for the garments through ZeroMission via a Fairtrade-certified project in southern India. We use Organic Content Standard (OCS 100 and OCS Blend) to assess how much organic grown cotton contains in a garment. The standard is based on national regulations for organic farming or the definitions found in IFOAM Basic Standard to determine whether the cotton is organically grown or not. OekoTex Standard 100 is an international measurement of safety standards throughout the entire textile chain. The OekoTex system guarantees that textiles have been tested and certified and that they contain no harmful substances. The list of demands contains more than 100 test parameters in order to guarantee that the textiles are harmless. Global Recycle Standard (GRS) is intended for companies which produce or sell products made of recycled material. The standard applies to the whole supply chain and focuses on traceability, environment principles, social requirements and marking. Since 2016 we have been licensed to produce and deliver GRS certifiable clothing. License number: CU846945. A Fairtrade certification guarantees that the cotton has been cultivated with fair working conditions and that the cotton grower has received fair compensation. Customers wishing to buy Fairtrade certified clothing have the possibility to do so through us. We have been certified since 2015. License number: FLO ID 32823. Global Organic Textile Standard (GOTS) is an international certification for the marking of ecologically produced textiles. GOTS focuses on both social and environmental demands and covers the entire production chain from cultivation, picking and preparation through to the manufacturing of the actual garment. We have been certified to manufacture and deliver GOTS certified clothing since 2016. License number: CU846945. Here you will find detailed information about our brands and their sustainability, as well as a link to their product catalogues (online or as a pdf). You will also find which certifications and quality assurances exist in each range.